In a previous post, I wrote about the diorama featured in the Robert de Niro film Ronin. Dioramas occasionally make an appearance in pop culture, and the one in Ronin was notable in that it was central to the theme of the movie. Out at sea, in the early mist that promised a hot day, the South Goodwin Lightship could just be seen, a dim red barque married for ever to the same compass point and condemned, like a property ship on the stage of Drury Lane, to watch the diorama of the waves and clouds sail busily into the wings while, without papers or passengers or cargo, it lay anchored for ever to the departure point which was also its destination. This passage showcases Ian Fleming’s writing at its most poetic and evocative. He’s flipped the script: dioramas are usually an example of art imitating life, but here, it’s life imitating art. So how did Ian Fleming become acquainted with dioramas? The most likely explanation is that during his work for Naval Intelligence in WWII, he attended briefing sessions in which dioramas of strategic military locations were used as visual aids. Using aerial reconaissance photos as source material, dioramas were often constructed to help formulate a sabotage plan, bombing run, or other military operation. Being able to visualize the target of the operation in three dimensions was vital to successful planning. Although literature critics often peg the Bond novels as pulp fiction, I suspect they do so more out of disdain for the politically incorrect nature of Bond’s character, rather than objective and unbiased evaluation. When Fleming created the original gentleman superspy, the term ‘politically correct’ was still decades away from infecting western culture. The 1960s gave us books and films which were intended as pure entertainment . . . a far cry from the subversive media of today. This is one of the reasons that era remains beloved by so many. Fleming’s output lacked consistency, but his better works compare favourably to the top authors of the espionage genre. 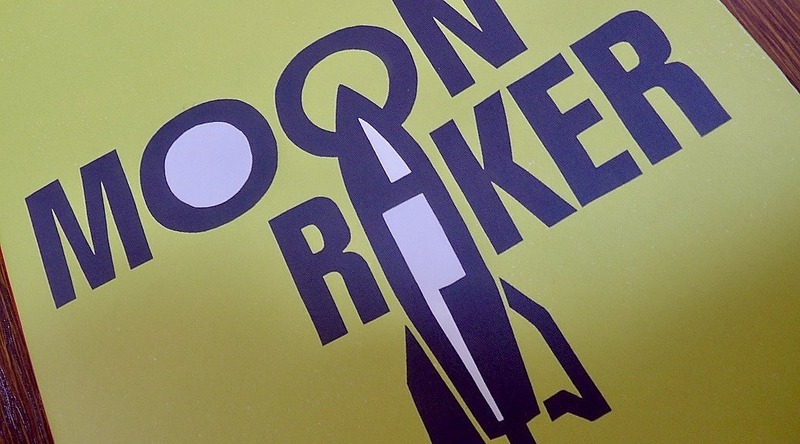 Aficionados of Bond books tend to agree that Moonraker is among his finest works. The novel bears little similarity to the film. Although both stories take inspiration from the world of astronautics, the plotlines are completely different. The titular craft in the novel is a military rocket based on Cold War era technology (a forerunner of the modern ICBM), whereas in the movie it’s a manned space shuttle. And while Fleming’s original story maintains a sober tone throughout, the movie vacillates between campy humour and grim realism. The producers never figured out if they wanted to make a comedy or a drama. James Bond will return (to this blog) in Goldfinger.